Iowa Diamond is different from just about every other jewelry store you’ve ever seen or are likely to see. Our difference lies in the way we sell diamonds and our enormous selection of engagement and wedding rings. In fact, Iowa Diamond has more engagement ring styles in store every day than all the stores in a major mall, combined! And many are exclusive to Iowa Diamond. So, what’s the other big difference? In short, our customers buy diamonds exactly the way a professional diamond buyer buys diamonds, under the same grading conditions, and with the same advantages. We are fifth-generation jewelers, having served the industry in many capacities for over three-quarters of a century. From manufacturing to gemstone cutting to retail operations…even teaching at a prestigious institute and university lecturing. From Long Beach, California, Mark Schneider is the only living ring designer with a piece permanently displayed at the Smithsonian. 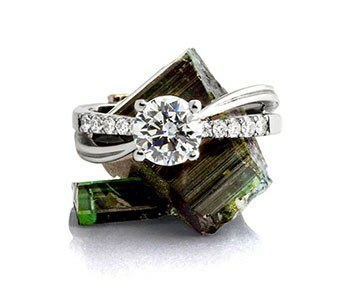 Mark's timeless and award winning designs are available exclusively for Iowa Diamond patrons.